The interactions between cations and the negatively charged groups in the cell walls of the xylem vessels (and tracheides) are similar to those in the AFS of the root cortex (Fig. 2.2). The long-distance transport of cations in the xylem can be compared with ion movement in a cation exchanger with a corresponding decline in the translocation rate of cations such as Ca2+ (Jacoby, 1967) and Cd2+ (Senden and Wolterbeek, 1990), relative to that of water (Thomas, 1967) or anions such as phosphate (Ferguson and Bollard, 1976). This cation-exchange adsorption is not restricted to the xylem vessels; in addition the cell walls of the surrounding tissue take part in these exchange reactions (Wolterbeek etal., 1984). The degree of retardation of cation translocation depends on the valency of the cation (Ca2+ > K+), its own activity (McGrath and Robson, 1984), the activity of competing cations, the charge density of the negative groups (dicots > monocots), the pH of the xylem sap which may vary between 5 and 7 and the diameter of the xylem vessels. The translocation rate in the xylem of heavy metal cations is much enhanced when the ions are complexed, for example, in the case of copper (Smeulders and van de Geijn, 1983), zinc (McGrath and Robson, 1984) or cadmium (Senden and Wolterbeek, 1990). Solutes can also be resorbed ('scavenged' or 'unloaded', see below) from the xylem (apoplasm) into the living cells (transport in the cytoplasm and vacuole) along the pathway of the xylem sap from the roots to the leaves. At least for resorption of potassium, the proton efflux pump in the plasma membrane of xylem parenchyma cells is the driving force for the H+/K+ antiport (De Boer et al., 1985). With increasing path length, also the concentration of amino acids in the xylem sap may decrease for example, in nodulated legumes (Pate et al., 1964). However, the opposite may also occur, namely an increase in the solute concentrations by a factor of two or more, as has been found for calcium and magnesium in castor bean (Jeschke and Pate, 1991b). Fig. 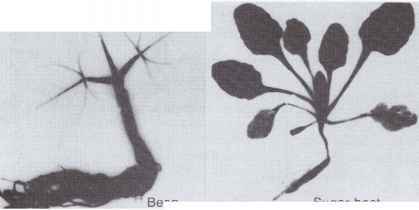 3.2 Distribution of sodium in bean (Phaseolus vulgaris L.) and sugar beet (Beta vulgaris L.) 24 h after 5 mM 22NaCl was supplied to the roots. Autoradiogram. lower stem, whereas in natrophilic species (e.g. sugar beet) translocation into the leaves readily occurs (Fig. 3.2). This restricted upward Na+ translocation is caused by selective Na+ accumulation in the xylem parenchyma cells (Rains, 1969; Drew and Lauchli, 1987) together with retranslocation into the roots (Fig. 3.10). In castor bean these two components led to a depletion in the Na+ concentration from 0.8 to 0.2 mm in the upward-moving xylem stream (Jeschke and Pate, 1991b). "Based on Saalbach and Aigner (1970). Distribution of Molybdenum in Bean and Tomato Plants Supplied with Molybdenum in the Nutrient Solution"
"Concentration of molybdenum in solution: 4 mg 1 1. Based on Hecht-Buchholz (1973). shoots, whereas in Phleumpratense and Trifolium hybridum this translocation is rather restricted. It is evident that in order to increase the sodium content of forage selection of suitable plant species is more important than the application of sodium fertilizers. Resorption from the xylem sap in roots and stems can also be a determining factor in the distribution of micronutrients in plants. In certain species, such as bean and sunflower, molybdenum is preferentially accumulated in the xylem parenchyma of the roots and stems. In these species a steep gradient occurs in the molybdenum concentrations from the roots to the leaves (Table 3.4). In contrast, in other species, such as tomato, molybdenum is readily translocated from the root to the leaves. In accordance with this finding, when the molybdenum supply in the nutrient medium is high, toxicity occurs much earlier in tomato than in bean or sunflower (Hecht-Buchholz, 1973). The composition of the xylem sap along the transport pathway can also be changed by the release or secretion of solutes from the surrounding cells. For example, in nonlegumes supplied with nitrate, the nitrate concentration in the xylem sap decreases as the path length increases, whereas the concentration of organic nitrogen, glutamine in particular, increases (Pate et al., 1964). In nodulated legumes (where N2 fixation occurs), on the other hand, the ratio of amides to amino acids is shifted in favor of the amino acids (Pate et al., 1979). Besides these specific aspects of nitrogen translocation, the release or secretion of mineral nutrients from the xylem parenchyma (and stem tissue in general) is of major importance for the maintenance of a continuous nutrient supply to the growing parts of the shoots. In periods of ample supply to the roots, mineral nutrients are resorbed from the xylem sap, whereas in periods of insufficient root supply they are released into the xylem sap. Changes in the potassium and nitrate contents of the stem base reflect this functioning of the tissues along the xylem in response to changes in the nutritional status of a plant. From this information a rapid test for nitrate in the stem base has been developed as a means for recommending rates of nitrogen fertilizer application (Section 12.3.8). Despite resorption along the pathway in the stem most of the solutes and water are transported in the xylem vessels into the leaves. Here water is preferentially transported in the major veins to sites of rapid evaporation such as leaf margins, or from the vein endings mainly via symplasmic movement towards the stomata (Canny, 1990). Although the bundle sheath walls of the veins are suberized in grass leaves of C3 and C4 species, they do not provide a barrier against apoplasmic flux of water and solutes (Eastman et al., 1988). Depending on the concentration and composition of solutes in the xylem sap entering the leaf, and the rate of water loss by transpiration, along its stream through the leaf, the solute concentration may be enriched manyfold at predictable sites, as for example, the leaf edges. This is particularly true when mineral element concentrations are high in the root medium (e.g. saline substrates) and for mineral elements such as boron and silicon (Section 3.2.4). Unless some of this excessive solute accumulation at the terminal sites of the transpiration stream is not removed, for example, by loading into the phloem, by guttation, as has been shown for boron (Oertli, 1962) or in epidermal glands in halophytes (Fitzgerald and Allaway, 1991), necrosis on the tips or margins of leaves occur (Fig. 3.7). This is a reflection of insufficient resorption of solutes along the pathway of the transpiration stream in the leaf. Fig. 3.4 Model for scavenging solutes from the xylem sap ('xylem unloading') in leaf cells. As , amino acids. Of course, the xylem import of solutes into leaves and the evaporation of water does not necessarily lead to the accumulation of the solutes in the leaf apoplasm. In fast-growing plants with only low nutrient supply, the solute concentration in the xylem sap declines sharply from the roots to the leaves and within a leaf blade from the base to the tip. For example, in barley the concentration of magnesium in the xylem sap decreased from the base to the tips from 1.1 to 0.1 him and for potassium from 18.0 to 8.0 mm (Wolf et al., 1990b). Similarly, in tomato water released by guttation from the leaf tips was virtually free of inorganic solutes (Klepper and Kaufmann, 1966). It is only recently that there has been any great interest in studying the mechanisms involved in the uptake of solutes from the apoplasm in leaves. This 'xylem unloading' or 'scavenging' of solutes from the leaf apoplasm is now reasonably well understood for the uptake of amino acids in legumes (Canny, 1988) and a number of broad-leaved trees (Wilson et al., 1988). The cells of the bundle sheath are sites of intensive net proton excretion which acidifies the apoplasm (Fig. 3.4), the proton gradient across the plasma membrane acting as the driving force for cotransport of amino acids and ureides. The activity of the proton pump in legumes is high before pod filling and disappears during pod formation (Canny, 1988). 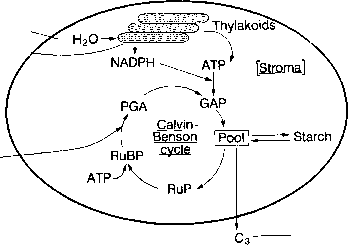 In the plasma membrane of leaf cells the existence of at least two separate transport systems for aliphatic amino acids seems to be established (Li and Bush, 1991). Although no information is available on mechanisms by which mineral nutrients are scavenged from the leaf apoplasm, a proton-anion cotransport for inorganic anions (e.g., NOf) is also likely (Fig. 3.4) as is established for root cells (Fig. 2.9). Uptake of mineral nutrient cations may be mediated by a proton-antiport mechanism as has been shown for the resorption of K+ from the xylem in the stem tissue (De Boer et al., 1985). 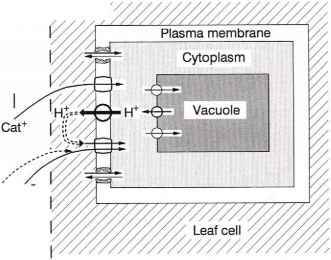 In view of the often high concentrations of mineral nutrients in the xylem sap and in the leaf apoplasm, for example between 5 and 18 mM K+ (Wolf et al., 1990b; Long and Widders, 1990) ion channels in the plasma membrane of leaf cells (Fig. 3.4) may more likely play a key role in 'xylem unloading' than in ion uptake by root rhizodermal cells (Section 2.4.2). Various methods are available for obtaining apoplasmic fluid from leaves (Meinzer and Moore, 1988) and application of these methods not only for determination of phytohormone concentrations in the leaf apoplasm (Hartung et al., 1992) but also of mineral nutrients will improve our knowledge of the mechanism of this final step of the long-distance transport in the xylem from the roots into the leaves.